My apologies for the late arrival of this edition of the Bulletin. This is only partly due to the production of the special edition on the Tanzanian Economy which was produced in November. This special edition was sent to the Press and interested members of Parliament. The reactions were favourable and the Chairman of the Society received a number of appreciative comments. The need to continue to present Tanzania’s case to the News media and public is sadly illustrated by a passage from Julius Nyerere’s address to the last session of the Tanzanian Parliament before the 1980 elections (This address has been published under the title ‘A Time of Struggle’). The President spoke of the problems created for all countries of the Third World by the recession in the industrialised world and the increase in oil prices and the struggle for a new international economic system. He then went on to thank those friendly countries which with grants and loans were showing a special understanding of Tanzania’s problems and a willingness to help -3weden, Norway, Netherlands, Denmark and Canada. Members of the Society will share my sorrow and shame that Britain was not on that list. My thanks to those who have sent me material for the Bulletin. I am particularly grateful to those who undertake the task of reviewing and commenting on new books. The books reviewed in this edition are of special importance and not easy to summarise critically but fairly. Department of Adult Education, University of Southampton. Rene Dumont’s book ‘False Start in Africa’ published in the early sixties warned of the dangers of poor newly independent African countries attempting to adopt the technology and life styles of the industrialised world which he saw as not simply irrelevant but a hindrance to real development. Dumont’s analysis and prescriptions were widely acclaimed among the new ‘Third World’ and ‘Development’ groups springing up during that period, but they found little support either from the large aid providers or the Governments of most developing countries. Almost alone Julius Nyerere saw the relevance of Dumont’s arguments for Tanzania and he is said to have required all his senior politicians and civil servants to read Dumont’s book. Its influence can be seen in the Arusha Declaration. Even Tanzania has found Dumont’s ideas difficult to follow and most other countries have ignored them but Dumont has continued to identify and criticise examples of the failure of large scale capital intensive schemes to produce any improvements for those relying on peasant agriculture. At the end of the seventies with both Tanzania and Zambia facing the most severe economic difficulties Presidents Kaunda and Nyerere asked Dumont to advise them on what had gone wrong. Dumont’s report to Nyerere has not so far been published although he has given some idea of what it contains in his news conferences and speeches. Now Dumont has published a book based on his work. It has the title ‘L’Afrique Etranglee’ and is not yet available in English. In the next edition of the Bulletin we hope to have a full review of this important new book. The following brief comment gives an outline of Dumont’s analysis of Tanzania’s problems. The Arusha Declaration, which was intended to curb the growth of an economic elite, gave new power to officials (‘state bourgeoisie’) as they expanded state control of economic affairs and too quickly baptised it socialism. In 1969 when TANU committed itself to the development of Ujamaa villages the first important act of the Central Committee was to disband the Ruvuma Development Association which had established successful cooperative villages according to Nyerere’s principles. The Minister for Rural Development explained this decision by claiming that ‘R.D.A. was scheming against the Party which ought to control all village development.’ This elitist ideology of directives from above which were to be passively accepted could not cope with the challenge of the genuinely self-reliant R.D.A. The agricultural marketing cooperatives were similarly wound up on the pretext that they had become inefficient and corrupt. To the peasants the state run marketing corporations which replaced the cooperatives seemed to be equally inefficient and corrupt. Moreover, the state corporations provided more employment for members of the ‘state bourgeoisie’ and added economic power to their existing significant political influence. The marketing cooperatives have been used by the Government to press for increased production of cash crops for export but this policy may not be in the best interest of the peasants. Food crops directly benefit the growers and keep them free of the money economy. The marketing of cash crops is outside the peasants’ control and the profits are largely used to support urban life styles. The Arusha Declaration was born out of the realisation that in post colonial Tanzania the real danger of exploitation was that of the rural peasants by the towns. Dumont claims that this situation continues as Government and Party Officials frustrate the implementation of Nyerere’s ideals. Notes from a visit in October/November 1980 by Geoffrey Rockliffe-King, Development Economist. I visited Tanzania for six weeks in October and November 1980 as part of a team engaged in a study for a U.N. agency. Prior to the field work I benefited from a desk study which revealed some of the most pressing issues for Tanzania. The field trip did much to dispel the gloomy prognosis of the desk study, although it is hard to see a possible way out of the investment/ foreign exchange trap. Morale was surprisingly high amongst lower rank civil servants. Their response to the rapid erosion of the buying power of their salaries has been to engage in home-based enterprises such as egg production. The rules preventing second jobs for civil servants have been circumvented by businesses operated through wives, a practice of many senior officials and politicians with large scale undertakings. The interest in the election in October, in which two ministers lost their seats, seemed to indicate some confidence in the government despite the economic setbacks. All over the country, people expressed hopes that life would return to ‘normal’, given a couple of decent harvests, now the involvements in Uganda and Zimbabwe were working themselves out. Import difficulties and self-defeating Government measures to fix prices have combined to promote a thriving black market. One trivial example is film, virtually unobtainable outside Dar; there the asking price was TSh 210 in October. Prices have been bid up for many non-luxury items, and distribution complicated by patterns of influence: you need a friend at the factory. This unfortunate development disadvantages those many people without influence and deprives the Government of tax. At the margins of the cash economy, we came across several instances of a return to barter. Inflation has certainly set back the gradual process of drawing cattle-holding peoples into the money system. Overstocking in the north is already having dire effects on the grazing lands, but there will be no enthusiasm for reducing numbers without trustworthy alternative stores of value. In the remote areas, there were signs that programmes to promote development were losing ground. The veterinary services, for example, were effectively immobilised by shortages of fuel and spares, were unable to pursue vaccination campaigns without vaccines, had run out of most medicines and lacked the essential chemicals to conduct post-mortems. It will not take long to lose the network of skilled veterinarians, which has been established at a great cost, if the vital inputs are missing. Similar problems were apparent with supplies such as fertilisers and insecticide; the absolute scarcity is compounded with daunting transport difficulties. I found ‘Ujamaa’, the drive for socialism, to be very low key in the approach of officials to the worsening economic problems. Indeed, many had to be reminded of the political context and most held quite pragmatic views on the subject. It seems that it was felt necessary to attract support for the movement by the provision of social services, and that somewhere along the line the notion of central government provision took over from the idea of self-help. Whatever the cause, the policy appears to be stranded and, without considerable resources, looks set to dwindle away. The political slant which I had anticipated turned out to be altogether different: people were very aware of external changes, as those events influenced Tanzania. I was surprised on several occasions by questions from junior civil servants in district towns on foreign policy issues, such as the workings of Lome II and the likely African initiatives of the new US President. Aesthetically, Tanzania exceeded all expectations, both in variety and appeal. In particular, I enjoyed the section of main road which follows the Great Ruaha for a distance between Iringa and Mikumi, an endless hill in spectacular scenery, although I may have been influenced by the smooth road after so much gravel! Our safari took us by Ngorogoro, a place which deserves the tour-operator’s superlatives if not his customers. We also passed through Serengeti and Mikumi National Parks. In the former, the game was so plentiful it appeared to be tethered. These Parks provide a welcome change of pace on the mission, and, a real bonus, a glimpse of four cheetah together, at dusk in the crater. It remains a mystery that Zanzibar can be so totally different from the Mainland when the 737 is airborne for only nine minutes from Dar; but the country is full of such contrasts and must surely build on its tourist potentials. As always, the mission enjoyed some lighter moments. One was our arrival at the Dodoma Hotel to claim our confirmed reservations, only to be told that all but six of the rooms had been demolished, “as part of the new capital expansion plan”. It came as no surprise to find that the six rooms were occupied by the master-planners themselves. The most memorable statement of the trip came from a Catholic Missionary, who told us that, for him, the border was not closed! In contrast, the most sobering moment was finding a long diversion indicated, on the approach to Singida, by a barrier with the terse notice; Closed, Cholera. The prolonged drought had given rise to acute water shortages in the middle of the country, with consequent public health hazards. One does not sum up Tanzania after one short visit. My initial reactions have been very positive, especially with regard to the feeling of freedom in the country. I hope I am able to go back and learn more, as the country certainly justified all the attention it was given in college. Investigations by Central Committee of C.C.M. into Mismanagement of Public Corporations. Most of Tanzania’s economic problems are created by forces beyond her control but her situation has been made worse by mismanagement in some of the public corporations (the so called parastatals). 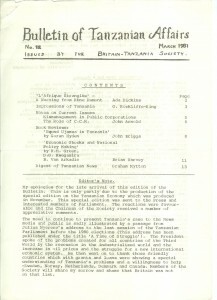 The previous edition of the Bulletin (No. 11) referred to the difficulties of the National Milling Corporation and also to the efforts being made to improve levels of management. The Chairman and General Manager of the Tanzanian Investment Bank were dismissed and two prominent businessmen detained as a result of the sale of a ship which had become the Bank’s property after the break up of the East African Shipping Line. The ship was sold for Tanzanian shillings although the Bank still has to pay some of the ship’s debts in foreign currency. The Minister for Communications and Transport and the General Manager of Air Tanzania both lost their posts as a result of the Corporation’s attempt to establish an international service with a leased Boeing 720 which turned out to require repairs and spares which ATC could not afford. Leasing substitute aircraft to meet commitment lost the Airline more money. The international operation has now been ended. At the beginning of February fifteen directors of the Pyrethrum Board were suspended when it was revealed that the Board had spent so much on its own administration that it had been unable to purchase pyrethrum flowers from growers since last November. In 1979/80 administrative costs were sh 16/60 a kilo against the market price of sh 15/44 a kilo for crude pyrethrum extract. Speaking at the Celebrations for the fourth anniversary of C.C.M. Julius Nyerere announced that the hire of private cars to Government Departments was under investigation. Is C.C.M. meeting its objectives? “We claim to be building a Democratic One-Party State. Our Constitution and that claim are based upon the theory that C.C.M. is a mass movement controlled by its members and responsive to their needs and aspirations. It is supreme because it is intended to be the people’s voice in directing government and in controlling the power of government as expressed through the organs of government – the Administration, the Courts, the Police, the Jails, and the Army. The Party is thus intended to be the people’s spokesman, the people’s method of organising themselves for voluntary co-operative activities, and the people’s protection against the arrogance and possible tyranny of government machinery and personnel. How successful is C.C.M. in fulfilling those stated objectives? We have a government consisting of C.C.M. Members; is the Party really channelling the people’s views to that Government as well as speaking for the Government to the people? Do the people really feel that the Party is their own instrument, which can be moved by them and used for their purposes? How close is the Party to the general masses of the People of Tanzania? At many levels we have given to one person two jobs at the same time: in the Party and in the Government. The President of the country is Chairman of C.C.M., the Regional Secretary of the Party is also Regional Commissioner; and since the establishment of urban and village governments we have made the town or village Party Chairman into the Chairman of the local council and hence into the head of the local government at that level. And every time these two jobs are combined, that of the Government tends to overshadow that of the Party. So that in practice all of these people have become government persons first, and only secondly the spokesmen of the people’s ideas, aspirations and complaints. They are so busy implementing government policy and defending government actions that they have little time to do purely Party work and to act upon – or even listen to – the proposals or complaints of the people. But the responsibilities of Government continue to be very attractive to Party leaders, and very often when they talk about Party supremacy a lot of Party leaders are in fact saying that all of them should have two jobs – and that the job in the Government should be the major one. This is a most stimulating and challenging book arguing basically that the resilience of the peasant mode of production has resulted in it successfully resisting attempts to ‘modernise’ it, either by capitalism or socialism. Although highly assertive and even repetitive at places Hyden, nonetheless, achieves his aim of analysing underdevelopment outside the commonly accepted notions of capitalist penetration and dependency, arguing that Marxist paradigms are inapplicable to Africa, and not least to Tanzania, for two reasons. Firstly, the peasant mode of production, because of its social logic, resisted capitalist penetration thus rendering this notion an unsatisfactory explanation of underdevelopment, and secondly, the vast majority of African peasants have not been alienated from their means of production (i.e. principally land), thus the development of antagonistic social classes has been lacking. Further, because o f its failure to break down pre-capitalist modes of peasant production, capitalism did not succeed in generating self-sustaining modernisation. The peasant mode of production has retained its resilience because of its success in satisfying man’s needs within the ‘economy of affection’ which recognises the importance of social structure, ties and obligations within the wider peasant system. As long as the ‘economy of affection’ satisfies needs, and assuming that famine is not a problem, then there is in fact very little incentive for peasants to accept innovations. This therefore means that the peasant mode of production can operate quite independently of state power~ or indeed of any other social class. It is quite capable-a reproducing and subsisting within its own social logic, just as long as peasants retain access to the means by which they can continue to secure their own reproduction, that is the land primarily. The state, therefore, is irrelevant to the needs of the peasant mode as it stands. Conversely, Hyden argues, the state is dependent on the peasantry as food producers and so is obliged, for its own existence, to control and subordinate the peasant sector because “history has demonstrated that the development of modern society is inconceivable without the subordination of the peasantry” (p.16). Hyden applies this theoretical stance to the evolution of agricultural policies in Tanzania. The resistance of many peasants to colonial attempts to develop agriculture is explained by the resilience of the peasant mode, and Hyden goes on to argue that the same resistance was applied to the attempts by the post-independence state, including the introduction of ujamaa and villagisation. More could have been made of the fact that the post-independence state attempts paid little attention to the results of the earlier colonial attempts. In many ways they followed the same path and consequently received a very similar response of resistance from the peasants. However, although Hyden suggests that in its attempts to control the peasantry the state becomes more authoritarian, he does not really explore fully the methods by which the state attempted to do this. Some are considered, but not deeply enough; for example, Operation Maduka (the establishment of communal village shops), and the conversion of political organisation from a mass party (TANU) to a more selective (and potentially elitist) party (CCM). Other features such as the use of minimum acreage bye-laws and the role of Kivukoni as an ideological college deserve far greater attention than they receive. The discussion of events of the 1973 to 1976 period are sketchy and assertive. Although Hyden is very correct in pointing out that the introduction of villagisation is a recognition by the state that they had failed to subordinate the peasantry, nothing is gained from blandly asserting that villagisation moved only about five million people and not the ten million people that other observers have suggested. No evidence is offered, and the reader is left wondering whether Hyden’s methodology is simply ‘think of a number between ….’! Perhaps when the 1978 census results are available in some detail, we will have a clearer idea of the number of peasants moved. Until then, this type of uninformed speculation is of little value. More seriously, Hyden consistently, and correctly, repeats the resource orientation of peasant production, but he ignores the effect of movement on peasants’ micro-environmental knowledge. Micro-environments and resource bases can alter significantly over relatively short distances, and so knowledge built up over many generations in one area may be of little value in an adjacent area of as little as two miles away. Clearly, this can have a significant deleterious effect on food production, an effect that can be considerably made worse by drought, as happened in 1974-75. In addition, on being moved to a new location, peasant priorities were to build houses for shelter etc. at the expense of planting food – after all, the state could be relied on to provide food to prevent famine, but could not be relied on to build shelters. As we know, Tanzania faced a major shortfall of food production at the time, and Hyden surprisingly accepts the view that the drought was the cause. Whilst few would share Lofchie’s extreme view that the drought was irrelevant, analysis would suggest that the effects of villagisation, the uncertainty this created among peasants, and the drought all contributed together to produce the crisis. Hyden’s argument at this point to support the drought school is very flimsy. He shows that National Milling Corporation grain purchases picked up in 1975/76 and 1976/77, a fact he attributes to more favourable weather conditions. Certainly this is part of the story, but so is the fact that peasants were now coming to terms with new micro-environmental conditions, they were now producing surpluses above requirements for the family’s needs after disruption, and they were now re-asserting their former self-confidence. In short, they were once more demonstrating peasant resilience to withstand external threats from the state, a point that Hyden apparently misses. On a more general level, the reader is left wondering whether peasants have the ‘exit option’ open to them. This is difficult to see in areas where population pressure is great and/or the carrying capacity of the land has reached its upper limit, for example. As land becomes ever more fragmented or indeed lost altogether to particular individuals, then a real threat exists that the peasant will be alienated from his means of production, something that must weaken the resilience of the peasant mode of production. By generalising about peasant modes and not paying special attention to these areas where this may be a problem, Hyden weakens his case. A major disappointment to the reviewer were the unoriginal proposals for the future development of rural Tanzania – the provision of a range of services supporting modern agriculture and the provision of consumer and capital goods to stimulate the consumer desires of the peasant. Having carefully read Hyden’s argument and found myself in broad sympathy with much of it, the profound disappointment at the end left me with a feeling of “yes, but we’ve seen this before”. This may be harsh criticism, however, for what is a most stimulating and thought provoking book, and one that is not only worth being read carefully by people interested in Tanzania, but also by people interested in the issue of African development, not only because of Tanzania’s experience but also because of the wider implications of Goran Hyden’s approach. Department of Geography, University of Glasgow. Economic Shocks and National Policy Making Tanzania in the 1970’s. R.H.Green; D.G.Rwegasira and B. Van Arkadie. Institute of Social Studies. Research Report Series, No. 8. The Hague 1980. 136 pp plus Introduction and statistical Appendix. The background against which this book is set is well-known. Tanzania is a poor country – its economy is characterised by subsistence agriculture, it relies on a handful of primary products for its export earnings, and it is dependent on imported manufactures. The hallmark of its development strategy is the intention to create a self-reliant socialism as evidenced by the Arusha Declaration, the leadership code, the creation of nationalised and parastatal institutions, and a commitment to the goals of greater equality, mass access to social services, popular participation in decision-making, and the achievement of national control over the economy. The book describes the basic dilemma of Tanzanian development strategy as follows. In order to transform the structure of the economy, basic services and industry must be developed. But this demands high initial level of imports. Due to fluctuating harvests, unstable world demand and prices, and the difficulties of raising production, exports of coffee, sisal, cotton etc cannot be: ‘relied upon to pay for imports essential for the development programme. Furthermore, food and other basic consumer imports exhaust part of the precious exchange reserves. Thus, despite the self-reliant philosophy, external borrowing is inevitable because “full compression to import levels sustainable without bridging finance would be very costly economically and politically”. In other words it would hamper development’ and further impoverish the people. As if this general position was not bad enough, 1973/74 saw the arrival of a series of ‘shocks’ – the effects of drought on Tanzanian food production allied with a rise in grain prices on the international market, and also a fourfold increase in oil prices with consequent secondary increases in shipping and fertilizer costs. The response of the Tanzanian Government was to accept and adjust to the oil crisis by raising petrol prices. But in order to preserve the development programme and maintain the commitment to equality the government also raised food prices ~o protect rural incomes; raised the wages of the low paid; expanded credit to permit the finance of stocks and work in progress; increased taxes and public industry prices to maintain funds for development projects and also recurrent spending on mass adult education, health services and water supplies. The inevitable balance of payments gap was to be financed by external borrowing. Because bilateral aid sources are generally not sympathetic to requests for import support, the option was – to take the upper credit tranche from the I.M.F. (together with the conditions attached to this facility) or resort to the international commercial credit market, both of which present a problem for a poor country, particularly one committed to a transition to socialism. 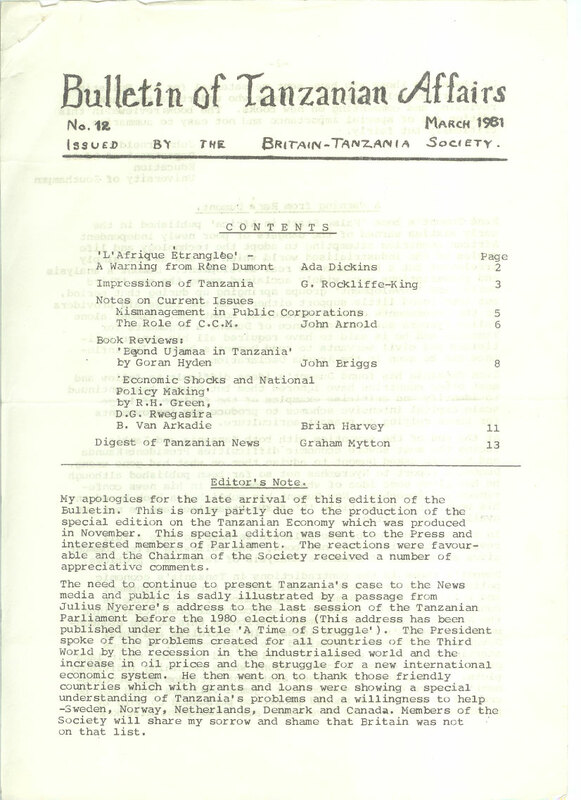 In addition to describing the 1973/74 crisis and Tanzania’s response to it, the report also attempts to evaluate economic policy. In addition to the usual difficulty that the consequences of the pursuit of an alternative policy cannot be known, this presents two major problems. Firstly the report points out that the “micro-efficiency” (technical efficiency) of market mechanisms would perhaps have been higher than the bureaucratic methods actually employed in response to the crisis (they may have involved lower administrative costs, fewer shortages, better distribution and the avoidance of a black market) but that the “macro-efficiency” of measures must also be considered, that is their consistency with the country’s chosen path to development and its commitment to maintain the development effort and to resist the growth of inequality. Secondly, the success or failure of economic policy is difficult to judge because of the distorting effects of external factors. Thus the coffee boom of 1976/77 brought unplanned benefits, while the 1974 drought, the lag in disbursement of promised foreign aid and the recession in the developed world represented distorting negative factors. But although a single measure of success or failure is not possible, the report does, with the admitted benefit of hindsight, suggest where mistakes have been made. Thus there is still scope for improving efficiency in agriculture, industry and the public service. Also, it is now realised that a crisis management (exchange control) approach to trade problems was misguided. What has to be admitted is that an export strategy is needed. Although the ‘primary product export’ path to growth had been rejected as outmoded and tainted with colonialism, failure to pay for necessary imports with export earnings will increase dependence on foreign borrowing. One particular feature of Tanzanian policy which there is widespread interest in evaluating is the villagisation programme. Perhaps ten million people were involved between 1973 and 1976, a period coincident with the food shortages and balance of payments problems described by Green et al. In what might be a carefully worded sentence the report concludes that “villagisation had little negative effect on 1973/74 output, and its subsequent short-term positive impact is probably low and not yet statistically demonstrable”. Sen. Lecturer in Economics, University of Nottingham, Dept.of Adult Education. Following the Cabinet changes also changes there were also changes in the C.C.M. throughout the country. One of the surprises was Pius Msekwa’s move to Tabora. The new executive secretary of the C.C.M. is Daudi Mwakawago who has for the past five years or so been principal of Kivukoni College. He was previously a Cabinet Minister and nominated MP. Another important administrative change is that the Head of the Civil Service is now Principal Secretary to the Prime Minister, instead of as before, to the President. The National Executive has decided that the practice of some leaders of giving permits to private individuals to obtain essential commodities from industries or companies must stop at once. The Executive was holding a special session to examine problems of scarcity and high prices. In December petrol and Kerosene pr ices were raised. Petrol went up to Sh9/35 per litre for premium and Sh7/25 for regular. Meanwhile Tanzania had another energy problem. The water level at Kidatu dropped so low that electricity output had to be cut. Low rainfall in many parts of the country meant that if factories maintained their usual output using normal electric power, the water behind the dam would be exhausted in a short time. TANESCO ordered Tanzania’s forty-eight largest enterprises to close down for a month last November in order to rectify the situation. The recent heavy rain is believed to have improved the situation. Tanzania signed an aid agreement for 42,000,000 shillings with the Swiss Government. The aid is equipment and technical assistance to improve rural road networks in Kilombero and Ulanga districts. The Tanzanian Government will contribute about 6,850,000 shillings to cover the cost of Tanzanian staff and local manpower on the project. The Swiss-Tanzanian Development corp plans to help Tanzania in various other projects in 1980-81, including the faculty of engineering in the University of Dar es Salaam. Finland has pledged to give Tanzania a grant of about 96,000,000 shillings during 1981 to cover four main Finnish-financed areas of forestry, water development, mining and construction industry. Denmark has agreed to grant Tanzania 970,000,000 shillings to finance rural development projects during the next four years; the projects include rural water supply and rural electrification. According to an agreement signed in Dar es Salaam on 6th December the grant will also finance teacher training programmes, the construction of three girls’ secondary schools, a vocational training centre at Dodoma, and health programmes. Bukoba: Eighty per cent of Kagera has already been rebuilt. An officer of the rural district development committee said since the rebuilding started in August of last year the rebuilding has been carried out satisfactorily. He said this while briefing the Swedish Ambassador in Tanzania, who visited the area to see the progress of the rebuilding of the Kagera area. The officer thanked the Swedish Government for its assistance of 10,000,000 shillings for the rebuilding of the area. He said all schools, dispensaries and government buildings that were destroyed during the war have now been newly rebuilt. Ambassador Wirmark saw the Kagera sugar factory and the area destroyed when the troops of fascist Amin occupied the Kagera area between October and December 1978. Tanzanian commission on reviving co-operative societies. The International Co-operative Alliance, ICA, has welcomed the idea of restoring regional co-operative unions. It said the move would consolidate co-operative activities in the country. This was said by the ICA regional director for East and Central Africa. He was talking to newsmen in Dar es Salaam yesterday on the idea. A special commission looking into the possibility of reviving the co-operative societies in the country is expected to submit its report to the Prime Minister soon. A statement from the Ministry for trade stressed that the trade policy directed that by 31st December 1980, leaders in the villages should ensure that every village has a well-established village shop with the capacity and capital to replace private shops. The emphasis of the trade policy was to open, not to close shops. The statement said licences would re withheld from private shops only in those villages which had reached to goal of well-established village shops. A modern multi-purpose wine factory is to be built at Dodoma next year at a cost of about 80,000,000 shillings. The new factory would be built in two phases. It would be producing an annual 500,000 litres of wine upon completion. The Dodoma rural district office has set aside some 200 ha for growing grapes for use at the factory. President Nyerere has commented adversely on the very high cost to the country of University education. Speaking at the degree ceremony in August he noted that the university was taking no less than 31% of the Ministry of National Education’s entire annual budget. He wondered whether such an amount could be justified. He called for people to come up with ideas for making higher education Cheaper, especially in view of the C.C.M. policy of building more universities. Mozambique. On 11 January President Nyerere welcomed home members of the Tanzanian People’s Defence Force from Mozambique. The President announced that there was a mutual defence agreement between Tanzania and Mozambique. Tanzanian forces helping to organise the regular Mozambique army had been in action repelling Rhodesian raids. Mozambique had in turn assisted Tanzania with men and weapons in the war against Uganda. in Dar es Salaam engineers from Mozambique and Tanzania had recommended that work on the construction of the 68,000,000 shilling unity bridge across the Ruvuma river should start in August 1981. The construction camp should be located near Masaguru on the Tanzanian side. Kenya. The border remains closed. But progress has been made. There was a summit of the three East African states in Kampala which was also attended by President Kaunda. Last July, President Nyerere commented that it was “not good” that Tanzania was doing business with all its neighbours except Kenya. But he said, there were still some outstanding issues of difference that had to be resolved. The Tanzanian Government confirmed that the 22 people killed on 22nd December by Kenyan police at Talek along the Tanzania-Kenya border were its nationals. The people, armed with arrows, bows and guns were killed after they had crossed into Kenya to steal cattle. A Government statement issued in Dar es Salaam today said that those who were involved in the incident were not members of the Tanzanian armed forces; they were Tanzanians living along the border in Mara region. The statement said the Government has strongly condemned the act of crossing the border into a neighbouring state to steal cattle as an act of lawlessness. Zimbabwe. At the end of the year, President Nyerere, accompanied by the then Minister of Trade, Ibrahim Kaduma, and Foreign Minister Salim Salim went to Zimbabwe. Various bilateral agreement were signed.